Every 2 weeks, a group of us (Kevin, Rick, Alvin, Grace, Romina and Janice) have been trying out specific Chinese restaurants featuring their signature dishes. These meals have been comped and host by ChineseBites. So far, we've been to Golden Swan and Fatty Cow Hot Pot. However, this particular meal would be the week right after Fatty Cow and it wouldn't be a Chinese restaurant. In fact, we weren't featuring any Chinese signature dishes. Huh? Okay, there will be the occasional meal that will deviate from our original mandate due to common ownership of restaurants. Our meal this time aro und was at Kibo in Yaletown. Occupying the former location of Charlie's (which lasted like a couple of months), Kibo is a hybrid of Miku, Minami and Hapa Izakaya. The decor is definitely Yaletown and the waitresses are definitely Hapa-ish. 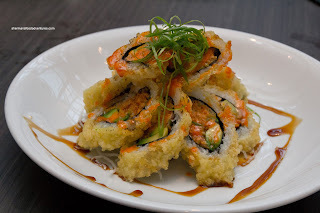 One look at the menu and it has similar elements as Miku with a dash of the original menu at Hapa Umi (however, at substantially lower pricing). So unlike the other ChineseBites meals, I am going to treat this like an actual post as we tried practically everything on the menu. As such, they came at us with a good amount of food. The first to arrive was the Negi Toro, reminiscent of the one from Hapa. It was served with toasted crostinis. The tuna belly was processed until smooth with just the right amount of scallions. There was a big hit of sesame oil (possibly a smidgen too much) as well as some spice (tasted like srirracha). It was topped with garlic chips and more scallions. There was a good contrast between the soft tuna and the crusty bread. 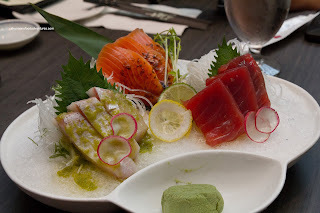 Next up was the Kibo Sashimi Set which consisted of red tuna, salmon and hamachi. The large slices of fish were fresh and neatly presented. The addition of sauces made it possible for us to eat the sashimi with little-to-no soy sauce. At $24.00, this plate was not cheap, yet the quality and large cuts of sashimi justified the price. 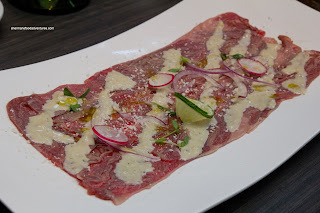 Moving away from seafood, we were presented with the Beef Carpaccio, which I could smell from quite a distance away before it was set on our table. 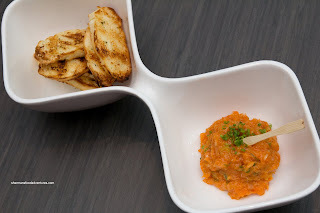 The Parmesan dressing with a hit of wasasbi was quite potent, yet welcoming at the same time. I found it to be creamy and cheesy with only a bit of heat. As for the slices of beef, they were a touch chewier than I would've liked. I think it needed to be sliced even thinner to achieve that melt-in-your-mouth effect. 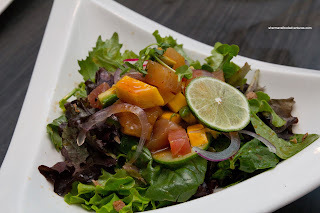 From meat, we went back to fish along with some greens in the Kibo Salad. It consisted of a mix of greens with red onion topped with mango, tuna and avocado. The ingredients were top-notch and prepared carefully. The dressing was tart and sweet with a touch of spice. Hey, it was a pretty good sashimi salad. The next dish was something that I haven't had for quite awhile. Consisting of tempura fried fish cake tubes filled with cheese, Chikuwa Cheese is one of my favourite Izakaya offerings. This reminded me of the one I had at Gyoza King. The batter was crispy and light with little grease while the chikuwa was not overdone. It was chewy, yet moist at the same time. The choice of cheese was perfect as it was melted completely, yet didn't ooze out. Presented neatly on a long dish was the Aburi Kibo Sush Set. This should not be confused with the one you'd find at Miku/Minami as these were not seared rolls. However, there is one item on the menu that is essential the Aburi Salmon Oshi found at Miku/Minami. Although these were good, in terms of sushi rice (it had a nice bite with hints of sweetness and rice vinegar). 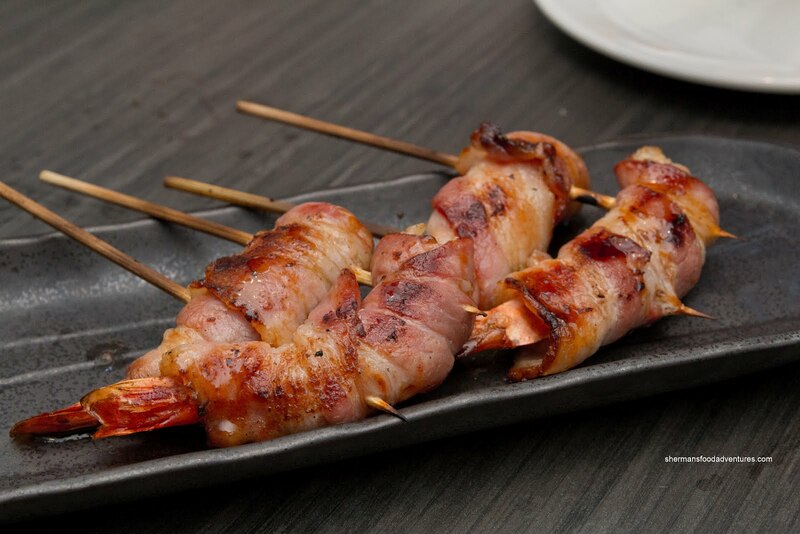 and ingredient quality, I still personally love Miku/Minami more for seared sushi. 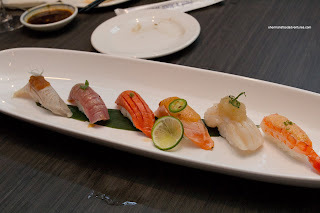 From left-to-right, there was the Tuna, Salmon (2 types), Hotate and Ebi. Moving onto some grilled items, we had the Japanese Short Ribs. These were predictably sweet due to the marinade. There was a good char on the outside which caramelized the flavours. I found the ribs to be a touch chewy, yet that is generally the case for short ribs (unless you put baking soda on it, which they would not do here). The next item was not my favourite - Bacon Ebi. The premise behind the dish was promising with a large ebi wrapped with smoky bacon. However, since it was grilled, it did not achieve any crispiness. Rather, the bacon was chewy and fatty, which made the whole thing hard to eat. I would've preferred the whole thing to be fried, hence the bacon would be a crunchy coating on the outside of the ebi. On the positive side, the ebi was very good with a nice snap. 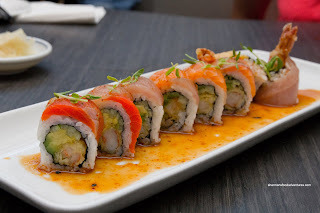 We moved onto the "roll" portion of our meal next starting with the Hamilton Roll consisting of ebi tempura, avocado and cucumber on the inside with alternating slices of tuna and salmon (Atlantic and sockeye) on top. The entire thing was finished off with a special sauce This was a neatly constructed roll with a large crispy prawn inside. The ingredients were good while the balanced sauce was quite nice. 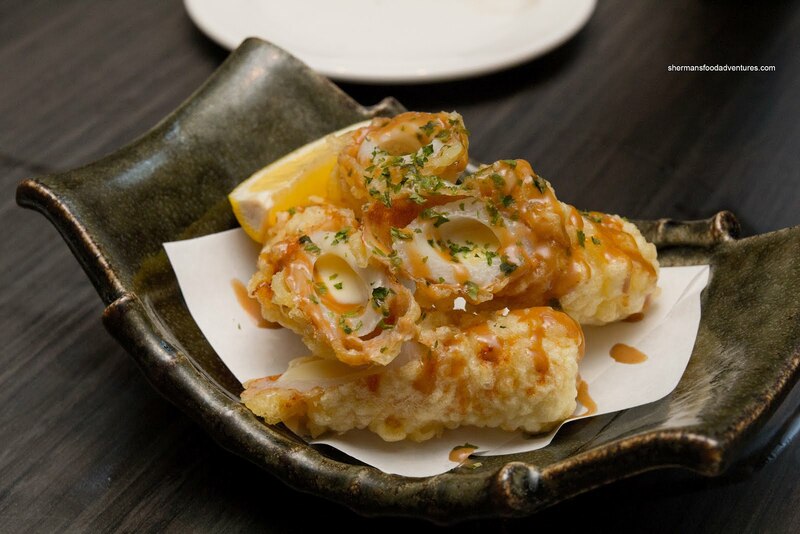 The next one to arrive was the Volcano Roll that deep-fried with tempura batter. On the inside, there was a combination of spicy tuna and avocado. Since the roll was essentially "cooked" in the deep-frying process, the tuna was also cooked. For me, I'm not a huge fan of cooked tuna in any of my sushi because the texture becomes dense and mealy. I would've preferred something else inside (like prawn perhaps). With that being said, the roll itself was fine with a crispy exterior and a bit of spice. Hey with any array of specialty rolls, it would never be complete without the standard right? Hence we got the ever-so-popular Dragon Roll. This familiar offering consisted of ebi tempura and cucumber in the middle with a good amount of unagi and avocado on the outside. 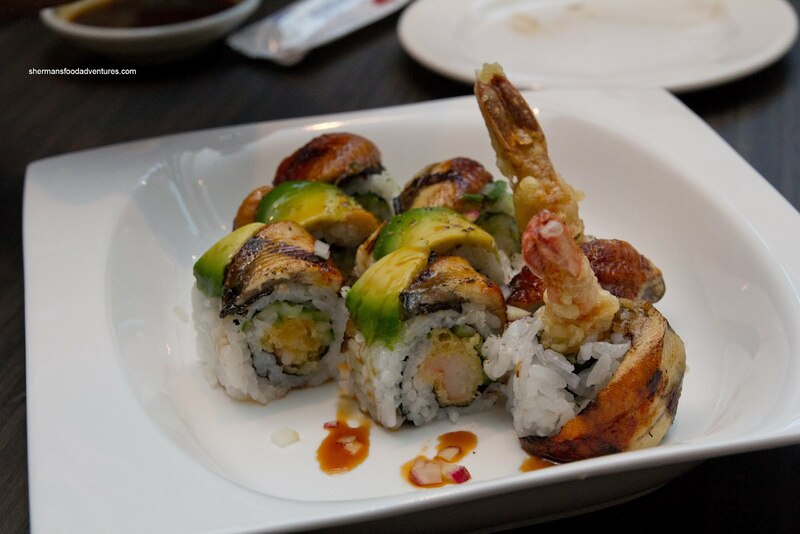 A drizzle of unagi sauce completed the dish. Nothing particularly exciting about the roll, yet it was good nonetheless. The large ebi was once again crispy with a nice snap while the ample amount of unagi and avocado provided another layer of salty-sweetness as well as a smooth texture. 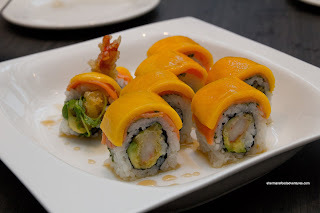 Continuing on the theme of ebi tempura and avocado, that was the same sushi base for the Mango Roll. Again, the ebi was large, crispy and had a nice snap. The avocado was ripe and soft, but not mushy. The generous slice of mango on top was visually appealing and tasty. It was ripe with a good amount of sweetness combined with the usual mango tang. Hiding underneath the mango was somewhat of a surprise - smoked salmon and basil. This actually "saved" the roll for me since a mango roll is well, a mango roll. The salty smokiness of the salmon with the herbal addition of the basil added a unique flavour. 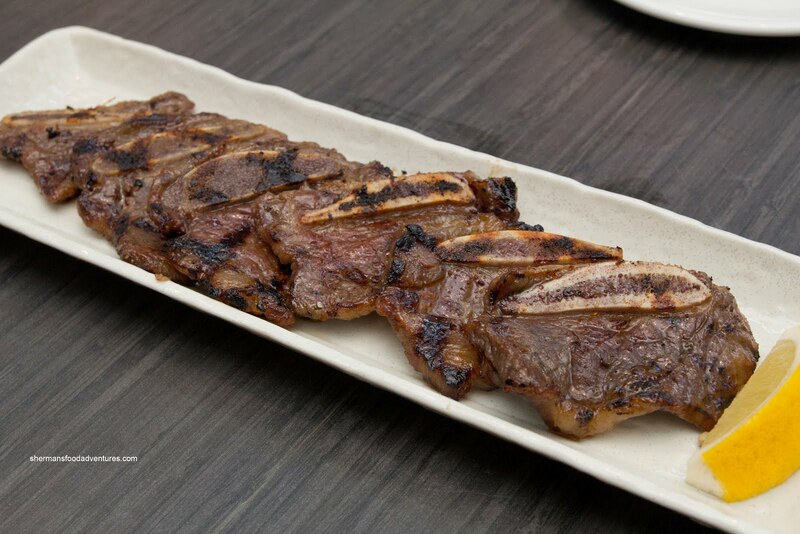 Moving away from rolls, we got the Kibo Beef which was BBQ Angus beef seasoned with a Chef's sauce. The beef was prepared a beautiful medium-rare. It was buttery soft and sat on a bed of shiitake mushrooms, asparagus tips and green beans. We weren't sure what was exactly in the Chef's sauce, but it was sweet with some Asian elements (like soy). 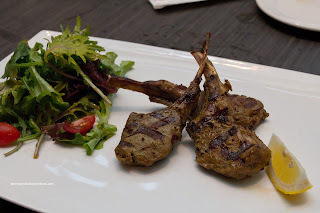 Yet another meat dish was the Rack of Lamb which was described on the menu as Australian rack of lamb with an Asian twist. We were trying to figure out what the Asian twist was about. We could clearly see some mustard seed and taste an obvious hit of cumin. Did this qualify as an Asian Twist? Not sure, at the very least, it was prepared by an Asian... Maybe that was the twist. No matter, we didn't really care since the lamb was super moist and tender. A few chews and it was ready to swallow. The flavour was quite nice as it wasn't too strong and allowed the lamb to s hine. With that said, the meat was not gamy. Lastly, we were presented with the Seafood Dobin. Yes, a soup as the last course. Hey why not? Turned out to be one of the highlights. 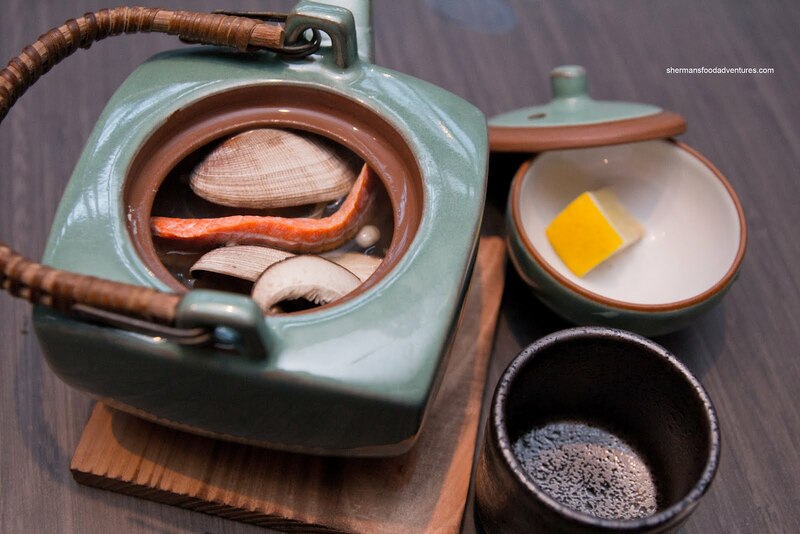 It consisted of a seafood broth with clam, salmon, shiitake and enoki mushrooms served in a teapot. The broth was a good balance between the salty miso and the natural sweetness of the seafood. Furthermore, the mushrooms added a welcomed level of E arthiness. This was a very concentrated and tasty soup. Obviously, by now we were pretty stuffed and naturally the service was fantastic (they invited us after all!). To be frank, I was a bit skeptical of the place before our visit. 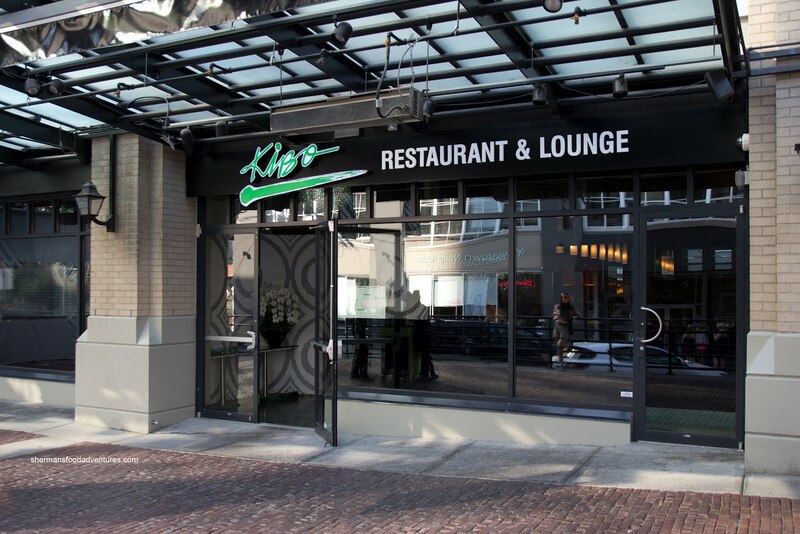 Think of it, another Asian fusion restaurant in Yaletown... 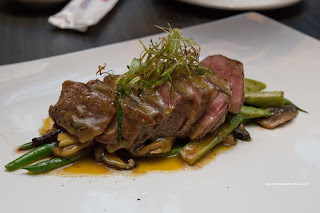 But the the food is generally pretty solid, if not a bit "safe" and the prices are reasonable when we do direct comparisons with other similar restaurants located in Downtown. - Location is away from the Yaletown "action"